Description: This plant often stands out because of its height and large cluster of pink/purple flowers. It is found in damp areas: in moist meadows or marshy areas, near ponds and along waterways. It can grow up to 12 feet high, but most are not that large. The stems are smooth and purple-spotted or solid purple. The leaves are arranged in whorls of (usually) five on short (1") leaf stalks at evenly spaced intervals along the stem. The leaves themselves are toothed, lanceolate, and much longer than wide, coming to a point. They are coarse with a somewhat papery texture, but firm. The vein pattern is clearly inscribed into the leaves. The flower clusters are at the top of the plant in a loosely branched and very symmetrical opposite arrangement. The flowers are small aster flowers, very similar to Boneset in apperance, which belies their shared genus. Edibility: This plant is not seriously poisonous, but it seems strongly medicinal. This is not a food plant. Medicinal: Many books mention this plant as being useful for some types of fever. Poisonous: Not seriously, but consumption in excess of prudent medicinal use would probably cause problems. Other Notes: Although this species is called Spotted Joe-Pye Weed, I mostly find individuals with very evenly colored deep purple stems. 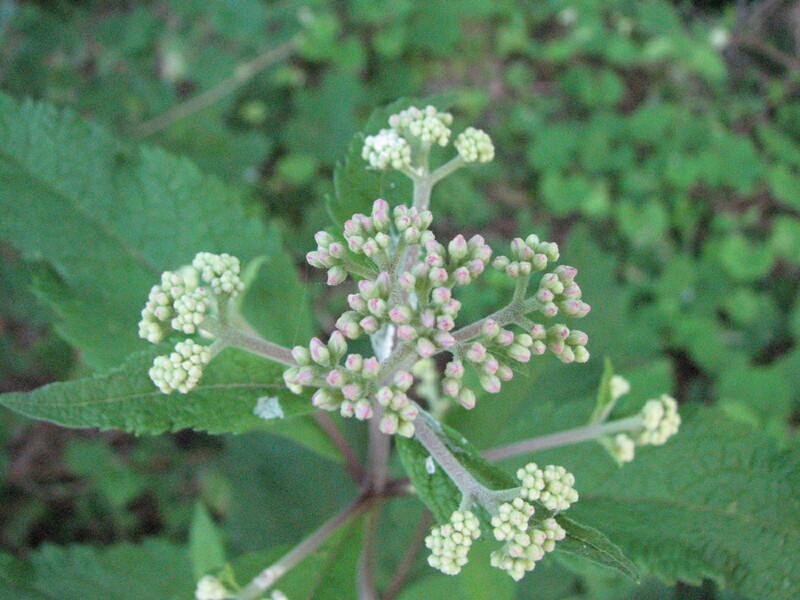 Ironically, there is another species in this genus, Sweet Joe-Pye Weed (Eupatoria purpureum), which, despite it species name has a mostly green-colored stalk. The species name refers to the purple coloring at the leaf nodes.